New Apple iPhone and software to transit users: get a car! We’ve known for several months this was coming: the operating system that runs the most recent iPhones and iPads (known as ios6) has been updated with a new maps application. Gone are Google Maps and public transit directions, replaced with a map app by Apple that kicks public transit to the curb, so to speak. What happens in ios6 when you ask for directions using transit in Apple’s maps? You’re referred to a list of apps in the Apple store that may or may not have anything to do with transit directions in the part of the world where you live. 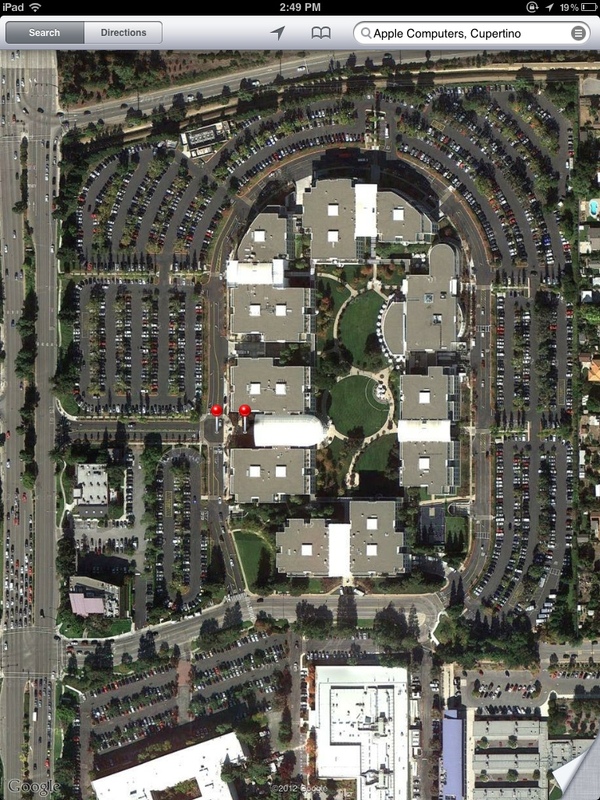 The photo above is Apple headquarters in Cupertino and its voluminous parking lots. Perhaps it’s not a stretch to suggest that transit directions are gone from the native map app in iPhones because a:) it takes a lot of time, effort and money to collect all the data from transit agencies and crunch it into useable software, as Google did, and; b) it doesn’t look like too worker/programming bees are taking transit to work at Apple HQ. •Metro’s smart phone app — available for both iPhone and Adroid phones — has a trip planner that offers transit directions. I know that some people don’t like it. My own experience is that it works pretty well at times and not as well at others. That’s the same experience I had with Google’s transit directions. In addition, Metro’s app allows users to find their current location on a map and then tells then the arrival times for buses and trains in the immediate area — a very useful tool when planning what time you need to be at a bus or train stop. 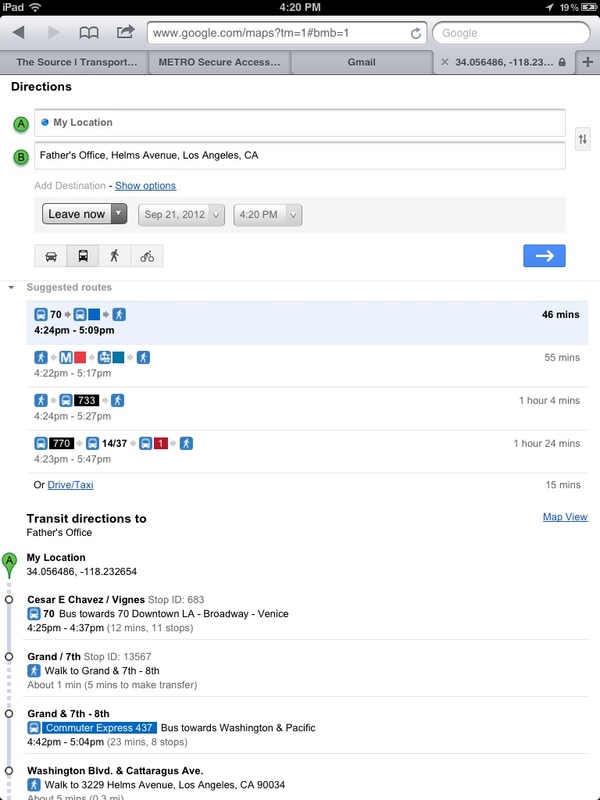 •Here also is a simple trip planner that Metro offers, as well as Nextbus arrival info. Both are easy to bookmark on your phone’s home screen. •Most large transit agencies these days have apps or mobile sites that either provide directions or schedules — or both. For example, if you’re in the Bay Area, the 511 site has an easy to use mobile site for transit directions. Will Apple build transit directions into its apps eventually? Hard to say. The company is notoriously tight-lipped about future products and I’m sure Apple is well aware that only five or so percent of Americans take transit to work. Perhaps Apple also knows that many of the people who use transit do so because it provides them the time to doodle around on their smartphones. As someone who has owned a lot of Apple products over the years, I’m quite pleased to see the company getting taken to the woodshed over the inadequacy of its new maps. Over the weekend, Joe Nocera in the New York Times put a whoopee cushion on Apple’s seat over the maps issue. And here’s a great Tumblr feed showing some of the mapping system’s more ridiculous gaffes. Need further proof? 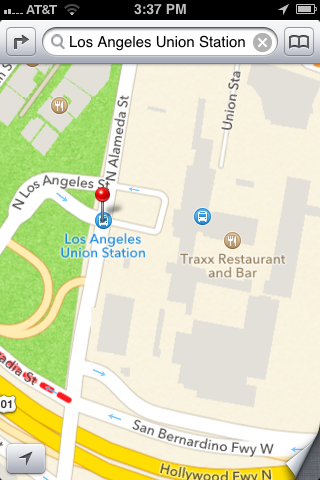 Here’s the map I got when I searched for Union Station. If you tap on the red pin, you get Yelp reviews for Union Station. If you tap on the bus icon, you get Union Station’s address and phone number — no links to Metro, Metrolink and Amtrak or other bus carriers that use the station. It’s only partially useful for those driving and I guess that’s Apple’s point. I like Metro’s app very much for the “nearby stations” and bus arrival times (waiting for trains too!) feature. I think it lags behind in terms of trip planning though, as the trip planner seems to be more of an embedded mobile website. The planner is also not “map based” and is rather text based, which just makes it a bit more cumbersome/messy. A nice, visual, map-based trip planner would make it my go-to app. One more reason not to get a smartphone of any pedigree. I’m quite happy with my own leash, that does nothing more than place and receive calls, and when it eventually fails completely, I will gladly pay a premium to avoid a smartphone. I too am sad that the new Maps app doesn’t have transit directions. Not because I think Apple owes me transit directions, but rather because it means I will have to use Metro’s more cumbersome and far less intuitive and flexible app. Although it would be convenient for all of us, why should the burden for developing a truly excellent transit app fall on Apple? Google should be releasing their own standalone app eventually. And this time, it should be receiving consistent updates unlike the stock version that was on the iPhone. At least when Google releases a separate standalone app it’ll should have cycling directions too. Whether it is Apple or Android, I think that readers of this blog would find solutions to their transit problems to be more helpful, rather than focussing on criticizing – that should be left to other sites. I believe that Apple has said that it is allowing app developers to interface their transit apps with the Maps app, in order to allow more (and hopefully better) choices. As Mr. Hymon mentioned above, you can bookmark Google Maps in Safari, which will address the issues for now, until other solutions come along. Hopefully, there are transit app developers out there, ready to fill in the void soon. For more information on Apple’s new maps, visit theamazingios6maps.tumblr.com. Anyway, I think Apple’s maps are (As tech blogger Rene Ritchie says) 1.5 steps forward, 2 steps back and a little sideways. The maps certainly do look a little better than Google’s, and the 3D feature is helpful for navigating around cities.. But some things certainly were not thought out properly. One can only hope they are working on integrated transit information. As RichS said, Apple has APIs so developers or agencies can create their own transit apps that integrate with the map app. I have no doubt we’ll be seeing not only general-purpose transit apps but also specialized apps for specific modes or audiences. It’s ironic: usually the general complaint is that Apple takes too much control (Open is better than closed! Rah!). Here, when Apple says to developers, “Maps is open! Let a thousand apps bloom!” the harumph is that Apple isn’t taking enough control by doing it itself. Now’s a better time than ever to end the Apple dependency. I’ve been using transit directions on Android for a year now. It’s been great. The timetables are accurate and even walking times are factored in. I noticed that Android manufacturers are running the exact same ads as they had been before the iPhone 5 came out, which is telling on its own. I’m surprised that a post like this made it’s way onto metro’s website. The author’s comments about technology are short-sighted, and does not belong on a site like this. Very unprofessional! If you want to scrutinized technology, start with metro’s under-developed iOS/Android app! Sorry, on this one I beg to differ. Even Apple has apologized for the quality of their maps.